CodeCampKidz - Building skill one project at a time! Building skill one project at a time! E-Learning Our progressive skill building platform was designed for kids to be successful on each project. New Projects New projects are being developed and rolled out on a monthly basis. Tablet Friendly CodeCampKidz is presented in a responsive layout that will adjust to tablet displays. Learn how to create a HTML form with labels, a textbox, textarea, radio buttons, checkboxes, hidden fields and a button. When you are finished you will be able to send information entered into the form to your email address. Easily customizable, you can add or remove up to 20 form fields to suit the needs of your page. 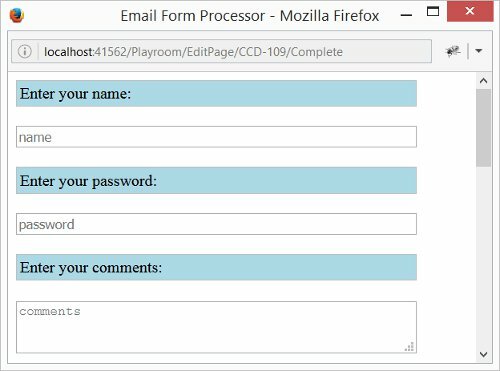 How to create an HTML Form. How to use a textbox. How to use a password box. How to use a textarea. How to use a radio list. How to use a checkbox list. How to use hidden fields. How to use a submit button. Add an email form of your design to a page. Your custom form will send the information right to your email address. Use if for comments, surveys or whatever you can think up. Please submit a code review when you are finished. Would you like to watch the project overview video? Open a gateway to a future in coding. Our unique, easy to use, eLearning platform was designed to introduce students to coding in a fun and achievable way. You will have fun building projects and learn real skill at the same time. It's a great way to get a foundation in coding and open the door to future possibilities! Stay up to date with our latest news and course releases by signing up to our newsletter. Update your information or leave the defaults.